Over the years, smallmouth bass have become a very prized trophy amongst recreational fishermen in the Lac St-François area of the St Lawrence, who organize frequent catch and release tournaments all the way up to the Cornwall area in Québec. This fall, up to 30% of specimens that came out of these sections of the St Lawrence had many large skin lesions on their back, flank or head. This is the first year to see such a high number of affected fish. These superficial lesions were round to oval and corresponded to areas of partial to complete skin loss exposing the underlying muscle. The appearance and size of the lesions is compatible with the attachment site of lampreys. Larger lesions that appeared more necrotic and profound were also found on the ventral portion of the fish, an usual location for lamprey attachment, maybe suggesting another type of problem. Local fishermen are becoming worried about the health status of smallmouth bass in the area. 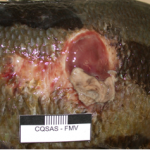 Because of the almost absence of such skin lesions on smallmouth bass in their long standing water quality records, the Ministère des Ressources Naturelles et de la Faune (MRNF – Québec) will try to further investigate the cause of these significant skin lesions. 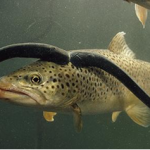 Lampreys attached to the skin of a brown trout. If these are introduced fish, perhaps they are serving a useful purpose in decoying the parasitic lampreys away from native fish?